It turns out Bullards Alley's upset of the Grade 1 Canadian International last year was an anomaly. 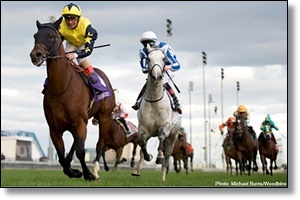 The race lived up to its name Saturday as Desert Encounter out-dueled Thundering Blue for a win in the $800,000 feature at Woodbine. Both the top contenders hail from Europe, with the winner stalking the runner-up throughout. Quite a stretch battle ensued as Thundering Blue, a flashy gray, looked best before chased down by Desert Encounter, who was sprinting on the outside. The final time for 12 furlongs on turf was 2:28.88. "I followed Thundering Blue all the way around," said jockey Andrea Atzeni. "I thought he was the horse to beat." It turns out he was, and now eight times in the last nine years the Canadian International has been won by an overseas entrant.